Kuwait, 29 October 2018: Abdulmohsen Abdulaziz Al Babtain Company (AABC), the sole authorized dealer of Nissan vehicles in the State of Kuwait, is delighted to announce the latest edition to its family of Nissan models. The reformed SUV that is now available in its showrooms located in Al Rai and Ahmadi comes with a bold new appearance and an intense color scheme guaranteed to win over all Nissan fans. The most powerful in its class, Nissan Patrol V8 is backed by a power of 400 hp, and torque of 560 Nm comes with the direct fuel injection system and the variable valve shift control technology, Patrol will give you maximum power with the lowest percentage of emissions while the new V6 has a 275 horsepower and 394 Nm of torque. The Patrol V6 offers 12% more torque while driving than competing cars. Strength, luxury, and flexibility await any customer to embark on any adventure. Poised to create a strong presence anywhere it goes, a fresh and modern design approach inspired the creation of the impressive exterior. The bold window graphic of the blackened A-pillar, 20” alloy-wheels, as well as the dynamic chrome grille all contribute to Patrol’s undeniable onroad presence. Conquering the off-roads means roughing through a diverse range of challenging landscapes. 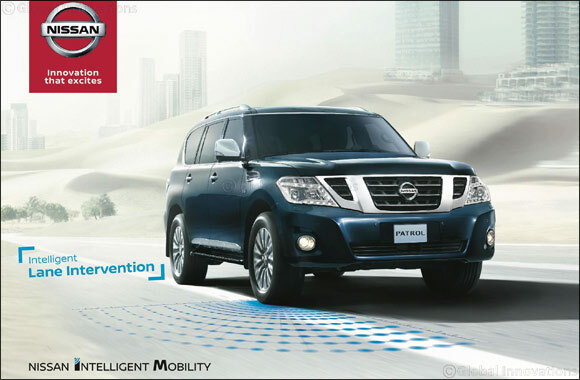 Fortunately, Nissan Patrol is well equipped to tackle any terrain thanks to its advanced technologies, thoughtful design, and incredible forethought. The heavy-duty frame at Patrol’s core is designed for improved structural rigidity without any compromise in ride quality. Discover the technologies packed inside Nissan Patrol are practical, useful and, often times, indulgent. They are designed to make travel easier, safer and a lot more entertaining. The Nissan Intelligent Key allows one to press a button on the door handle or hatch to unlock the doors, while keeping the keys within the pocket or purse. And with Remote Start, one can start your Nissan Patrol from nearly 60 meters away, allowing the cabin to heat or cool. When it comes to blind spot warning, if another vehicle is detected in the blind spot area, Blind Spot Warning flashes the indicator to put the signal on, and the indicator flashes with a warning chime to alert the driver. Intelligent Forward Collision Warning is on the lookout when one can’t see what’s going on ahead. It watches two cars ahead, monitoring your speed and distance, and when it detects sudden deceleration, it gives the driver a heads-up to slow down. The Rear Cross Traffic Alert helps one to back out of a space with more confidence as it watches around the rear of the PATROL. The intelligent braking system can help save the passengers from a potential frontal collision. It monitors the speed and distance between the driver and the car ahead and can alert the driver to slow down. It can even automatically engage the brakes to help avoid a collision or lessen the severity of an impact. Nissan Al Babtain invites customers to visit its showrooms located in Al Rai and Ahmadi to seize this exclusive opportunity and discover the dynamic features the Nissan models have to offer.